Today, I remove my red-and-white tinted glasses to acknowledge the reality that German soccer has taken the most-prominent seat at the world sports-viewing table, despite the lack of involvement from my beloved Billy Goats. The UEFA Champions League will wrap up its season in London with the only possible outcome being that a German team will be champion. I’m certain some would argue otherwise, but FC Bayern München has been the best soccer team in the world this year. You might could even argue they’ve been the most-dominant team in all of professional sports the last 10 months, but then you risk drawing in the face-painters with their “soccer is stupid” and all that trash, so I’ll leave it alone. This is the third trip to Europe’s championship match in the last four years, but the Bavarians have fallen short each of the last two attempts at capturing the title, including last year when the deciding match was played at their home stadium. On the other side of the field will be a team all-too-familiar to Bayern, though not-at-all familiar to a huge segment of football fans who don’t follow the Bundesliga: Borussia Dortmund. Despite the long-term standing of Bayern München as Germany’s lone entry in the elite of world football, the BVB (Ballspielverein Borussa, if you must know) were domestic champions the last two seasons, beating Bayern in each of their regular-season matches along the way and capping it all by drilling the Bavarians in the German Cup final in Berlin by a tune of 5:2. Though Dortmund didn’t really have the history to claim a long-term rivalry with Bayern, they’d certainly done enough on the field to thwart Germany’s elite club to inspire a brand new and white-hot rivaly, at the very least. Bayern’s response to being forced into the back seat by the men in black (and yellow) was to jam even more talent onto a roster heavily laden with some of Europe’s top talent. Dante (Borussia Mönchengladbach), Claudio Pizarro (Werder Bremen), and Mario Mandzukic (Wolfsburg) were already widely known across Germany for being stand-out players for their former clubs. Javi Martinez (Athetic Bilbao) heard his name being mentioned along with many of the world’s most-successful clubs before moving to Bavaria on a 35 million Euro transfer. Xerdan Shaquiri (Basel) caught the eyes of many when he helped his club achieve the knockout stages of last year’s Champions League competition, not the least of whom were his new employers who lost 0:1 at Basel in the round of 16, before delivering a 7:0 message in the return leg at Allianz Arena. Okay, probably losing in the Champions League final twice in three years was also part of the reason for the escalation of the arms…er…legs race, but becoming champions of Europe is much more a lofty goal for any club, whereas domestic championships are simply expected of clubs like FC Bayern. Too much of this lately for Bayern after big moments. Even before last summer’s seeming overkill spending, Bayern owned a reputation for hording talent, making them villains to every German fan base other than their own. Dortmund, having had a history of financial struggles, are relatively frugal in their spending on players, depending largely rather on home-grown talent and a few gold strikes in Poland to end up with a roster which, position by position, is as talented as any in Europe. Naturally, this makes Dortmund a very sympathetic side in tomorrow’s big match. Bayern will have their fair share of fans, due to having a longer-established profile on the international scene and more well-known players, but the story of Dortmund is almost too compelling to deny. For me, there are added issues. I’ve been to exactly two Bundesliga matches in my lifetime, both in 1994. 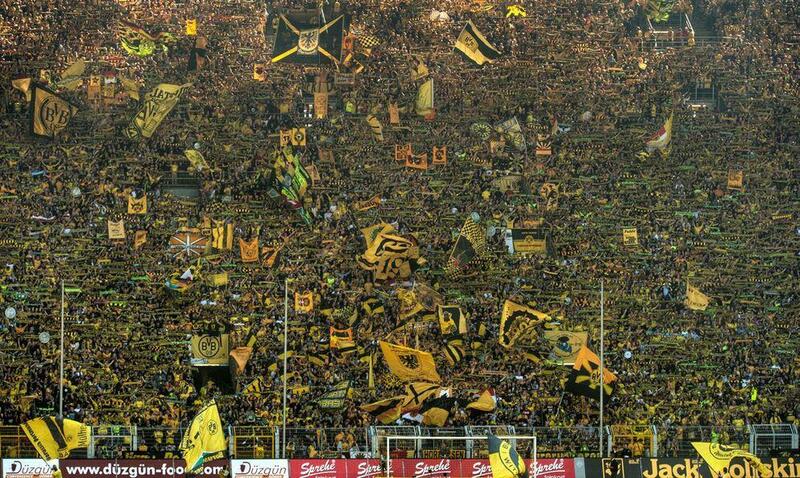 The first was in Westfalenstadion to see Dortmund beat Bayer Leverkusen 1:0. The second was at Wattenscheid (remember when they were in the top tier?) where Bayern were guests, winning 1:3 on their way to the league championship. Even before I let my Bayern-fan friend Halid talk me into going to a soccer game (“Ugh. How boring! Nobody ever scores! Who’d want to watch that?’ Yeah, I was that guy. ), I had been given every indication Bayern was not a team of the people. Because I was the guy in the parenthetical back there, I tried to force everything into an American perspective, and, from my American perspective, Bayern was the New York Yankees, the Los Angeles Lakers, and the Dallas Cowboys. That is, teams I compulsively despise due to my perception of their spending their way to successes my favorite teams didn’t get to enjoy quite as regularly. I had a good time at the Wattenscheid ground, surrounded by Bayern fans of varying levels of sobriety and all seemingly armed with accents completely foreign to my ears. My German was never that strong, but by halftime I wasn’t sure I was learning the same language all the surrounding fans were using to satisfy their curiosity as to what an American (Don’t Americans hate football?) was doing in their fan block. I remember needing Halid to translate a lot for me. But my day at Westfalenstadion was simply incredible. The place is immense, holding over 80,000 enthusiastic fans. I can’t pretend I understood, at all, fan cultures or choreo or the chanting and singing at all, much less enough to have appreciated it for what it was, but I can tell you the overall impression made on a very naive small-town Michigander at the time was remarkable (you know…as if it compelled me nearly 20 years later to still do all I can to follow the league from 9 time zones away and write about it). Cliche, but the photo doesn’t do it justice. You have to go there, just once, as a sports fan. You won’t regret. Can I come? By all rights, the BVB should be my favorite team. I could claim them and, with a simple explanation of their being central to the genesis of me following the sport at all, escape any and all charges of hitching on what is easily European football’s trendiest bandwagon. And, you know what, I am on that bandwagon. I love the BVB. I really do. After 1. FC Köln, there is no other club I watch more frequently. I hope they win every game, other than when they play the Effzeh, which is not currently a problem as they’re not even in the same league. Despite all of this, I’m here to tell you that I think I want Bayern to win the championship over Dortmund. I should clarify. I don’t want to watch the match tomorrow and see Bayern gain victory. Of course I don’t want that. I want to see Roman Weidenfeller throw up an invisible brick wall in front of his goal, while Marcel Schmelzer, Mats Hummels (he has to play, yeah? ), and Sven Bender shut Thomas Müller into a box of ineffectiveness. I’d love to see Marcel Reus do all the wonderful things that make Marcel Reus maybe the most-exciting of the rising crop of young German talent. I want to see Kuba’s gritty determination set the pace. But most of all, I want to see the smile on the face of the player who came out of the fan stands, Kevin Großkreutz, when his boyhood favorite club raises the trophy. All this is what I’d like to see on the television as I watch with maybe a nice German pilsener in hand. Doubt I’ll be drinking a Dortmunder tomorrow, but I’m definitely not drinking any weizen, either! The problem is, should that happen, the club on the other side of the win-loss equation, armed with seemingly endless bounties of financial support, goes into the transfer window period thinking that they need to buy more, more, more, and more!!!!! Despite having a lack of playing time for Mario Gomez, one of Germany’s best goal scorers, due to the scoring proficiency of Mario Mandzukic, Bayern has already secured yet a third Mario for next year, having snagged Mario Götze from Dortmund’s roster. While they certainly would not be faulted for an interest in a player some had begun to call “the German Messi” before injuries slowed him down a bit last season, it’s not difficult to imagine a second motivation behind the move, which is that weakening opposition rosters makes dominance that much easier. Bayern comes off somewhat like a cross between an extremely horny teenage boy and George W. Bush. Without the release of finally finishing the deed and winning the European championship, things continue to back-up. All that frustration prevents rational thought, with all resources dedicated to doing whatever it takes to get off, turning, meanwhile, into a menace to society with far too much power at your disposal and no concern for responsibility to those around you who might be impacted. 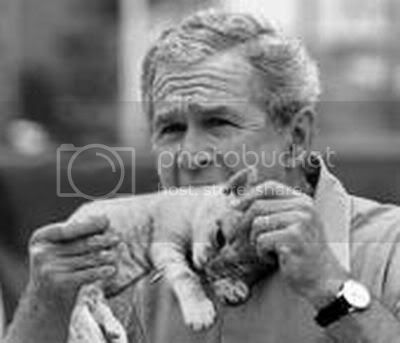 Like the former President, Bayern would eat kittens if they thought it’d get them the title. It’s true! I saw it on the interwebs! So, in a way, what I really want, for the health of German football in general, is for Bayern to bust its nut tomorrow, to capture their Saddam and just stop with the madness for a little while, while hovering over their precious long enough to forget to try to ruin the fun for everyone else. And I hate that I want that. You don’t wish to see such behavior rewarded, but, at this point, I don’t see any other way to get it to stop! On the flip side, you simply know that Dortmund can and will handle a loss in a much better way. Not only because they don’t have the resources to try to bash the rest of the league over their collective heads with money, but because that’s simply not how they got to be who they are. It’s not their identity. They’d lose with dignity and remember the ride fondly, after initial disappointment. But if they do manage to spring the upset, I’ll have a grin on my face wide as Jürgen Klopp’s for a wee bit, before I take cover in anticipation of another summer of Bayern on the warpath. Okay, this resolved, I’m excited to watch the match and then get back to worrying about Effzeh matters. There’s a coach to be hired before team planning and the transfer window, all just distractions from the big gap until it all starts over again in August. Be the first to comment on "Looking Forward to the All-German Champions League Final"